Skyloft as it appears in Smash. Skyloft (スカイロフト, Skyloft) is a stage in Super Smash Bros. for Wii U and Super Smash Bros. Ultimate, first revealed in the Nintendo Direct at E3 2013. The stage is set in the Skyloft area of The Legend of Zelda: Skyward Sword. A Battlefield-like design but with the lower soft platforms slightly tilted. Two soft platforms with a similar design to one of the rooms from the Underground Maze in Melee's Adventure Mode. Four soft platforms, with a lone platform at the upper right. A long slightly tilted soft platform. After that, the stage reverts to its Battlefield-like design and returns to the starting point, starting the stage's cycle anew. A grounded area in front of the bazaar. A bridge over a stream. In front of the Statue of the Goddess. On top of the Statue of the Goddess. A windmill that is topped by a bird's nest. This area has two other platforms to the right of it that were not present in The Legend of Zelda: Skyward Sword. In front of the fortune-teller's house and the bench above. The roof of the Knight Academy. The large floating island with waterfalls above the lake. The top of the Light Tower. The base of the Light Tower. Loftwings and Beedle's Air Shop also fly around the stage. The underside of Skyloft can meteor smash fighters. 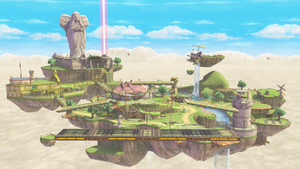 When hazards are turned off in Ultimate, the platforms never travel around the Skyloft area and instead, only uses the first layout listed above. In Super Smash Bros. for Wii U, the Ω form uses the same base platform as the normal version; this time without soft platforms, featuring a temple-like design on its bottom. The platform will still tour around the stage, but will not stop at any places of interest. Players will also notice that the soft platforms on the Goddess statue are missing. Star KOs occur. In Super Smash Bros. Ultimate, the main platform of the Ω form and Battlefield form is similar to SSB4's Ω form; however, it is resized and reshaped to match Final Destination and Battlefield, respectively. The three soft platforms of the Battlefield form resemble the ones in the normal form. Skyloft as it originally appeared in Skyward Sword. Skyloft is Link's homeland in The Legend of Zelda: Skyward Sword. In Super Smash Bros. 4, it is faithful to its appearance in the said game, with the only known differences being the addition of two platforms near the windmill. Specifically, the Skyloft stage is in the state that Skyloft was in throughout the middle of the game, as the colorful beacons were not present at the start of Skyward Sword, nor was the Light Tower open, and the Statue of the Goddess broke away at the end of the game. The touring set of platforms appear to be original designs. Skyloft trophy in Super Smash Bros. for Wii U. In The Legend of Zelda: Skyward Sword, Link and Zelda grew up on a series of floating islands called Skyloft. When you play this stage, you'll get to fight in several areas seen in Skyward Sword, including the Knight Academy and around the Statue of the Goddess. It's a pretty fast-moving tour, though, so don't get left behind! In The Legend of Zelda: Skyward Sword, Skyloft is a series of floating islands where Link and Zelda grew up. When you play this stage here, you'll get to fight in various areas seen in Skyward Sword, including the Knight Academy and around the Statue of the Goddess. It's a pretty fast-moving tour, though, so don't get left behind! 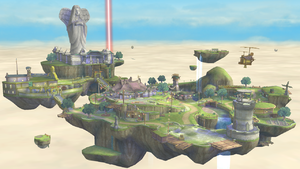 An overview of Skyloft in Super Smash Bros. for Wii U. A closer image of Skyloft. Mario taunts, while flying above Skyloft. Link in front of a few houses. An early version of the touring platform that travels across Skyloft. Pit jumps from the top of the Light Tower. Link and Donkey Kong battle in front of the Statue of the Goddess. Villager on top of the windmill. Wii Fit Trainer by a bench. The platform prepares to land. The platform dissipates, as it lands in front of the Bazaar. Donkey Kong and Villager on top of the Light Tower. Mega Man and Fox, fighting on the stairway leading to the Knight Academy. Mario in front of the lake. Fox and Rush on the small floating island. Luigi grabs an edge, possibly the large floating island featuring a waterfall. Mega Man in the Light Tower part of the stage. Mega Man and Wii Fit Trainer on the bridge. Note the Loftwing in the sky. Toon Link and Rosalina on the stairway. Villager and Luma near Rupin's house. Kirby and Samus on the main platform. A full view of the stage from above. Chrom using Double-Edge Dance on the stage in Ultimate. Fox idling on the stage. Lucas using his Rope Snake on the stage. Lucina idling on the stage. Lucina taunting on the stage. Luigi using his Fireball on the stage. Meta Knight taunting on the stage. Palutena using Explosive Flame on the stage. Piranha Plant attacking Wario eating a Maxim Tomato on the stage. Alolan Raichu on the stage in Ultimate. Alolan Raichu using its attack on the stage. Richter pummeling Lucas on the stage. Rodin using his version of the Wicked Weaves on Bowser on the stage. Roy striking Link with his neutral aerial on the stage. Toon Link trying to avoid a Cucco on the stage. Wolf posing with his Blaster on the stage. Yoshi with Mr. Game & Watch and a Giant Yoshi Egg on the stage. The Ice Climbers taunting on the stage. The image of the entire area that was included in the E3 2013 press kit lacks the platforms that have been added near the windmill topped by a bird's nest. In early versions of the game, multiple things were different, such as the second layout being thinner and the stage transitioning faster. Star KOs were also enabled. This Star KO removal also applied to Mushroom Kingdom U. When the touring platforms are rising under the floating island, any item caught in between the bottom of the island and one of the platforms will be pushed off the stage. Unlike with most parallax scrolling stages, the background animation in Skyloft is preloaded, and as such altering the gameplay speed will cause the background's framerate to become choppy, either by forcing frames to be skipped, or by slowing the rate at which the frames transition. This page was last edited on April 16, 2019, at 08:09.